One of the problems with this remodel is that I have removed cabinets that were covering up exposed steam pipes which attach to the radiator. Now I am stuck trying to figure out how to hide the pipes but still get steam to my radiator. 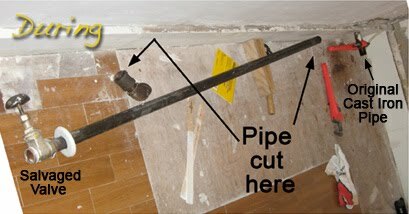 Because the pipe that comes up out of the basement and into the kitchen is original cast iron it is not possible to unscrew it and hide the piping in the wall without a pretty good chance of cracking the pipes. 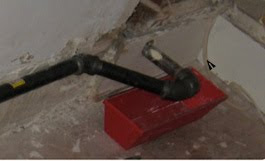 After consulting with a plumber about my options we decided the best bet would be to loop the pipe back towards the wall, and run in along the wall under a soffit disguised as a baseboard. The plumber quoted me $600-800 to do this. Now I don't know much about plumbing, but re-routing some pipes didn't seem that hard. Plus it was all exposed, nothing was going to be hidden in the wall so I figured I would give it a shot. I also figured if I screwed it up it would still cost me $600-800 to fix it, so why not try it? You can see the footprint of where the cabinets use to sit. At this point you can see we have removed the paneling. There also (not shown) is now a HUGE foot sized hole in the plaster above the pipe where the plumber kicked the wall in to look at the fittings. That is how we learned the pipe and fitting inside the wall were cast iron. The elbow joint and the pipes parallel to the wall are much newer (probably 1950s) so he thought those would be okay to try to remove. First things first: LabDad and I spent a good hour trying to get ANY of those fittings loose. We had a teenie bit of movement in the elbow joint, but without removing the long pipe there was no way to unscrew it. We cut the pipe right next to the fittings in order to allow us to rotate the elbow joint. At that point we were left with the original cast iron pipe sticking 4 inches out of the wall (5 inches if you count the 1 inch thick baseboard molding we planned on removing.) We also successfully unhooked the valve (to turn the radiator on and off) so we wouldn't have to buy a new one. I went to Home Depot and bought all the parts I needed for the new line. After dry fitting it all, I realized that in order to hide the pipe most effectively, I would need to remove the baseboard and the plaster so that I could hide the piping in the wall. This is where my nightmare began. The baseboards in this kitchen are original to the house, and so when each consecutive floor layer was laid down, they just stacked it up against the baseboard. (I counted at least 4 different floor layers.) Meaning now, 100 years later, the baseboards are actually embedded below floor level by a good inch. There is NO WAY we were going to just pop them off. We instead had to pry them up section by section, and using a hacksaw, cut them off bit by bit. It took at least 3 hours to remove 4 feet of baseboard. I have no photos of this step since it was not something I ever want to commemorate. It just plain sucked. Fortunately, with a lot of help from LabDad, we were able to successfully remove the baseboards and notch out the plaster so we could snuggle the pipe right up into the wall. You can almost make out the foot hole above the pipe in this picture. You can also see where we hacksawed through the molding (just above the left hand corner of the mud pan.) We left the molding in tact here because it will be hidden under the new cabinetry. Once we knew we had all the right fittings and pipe lengths (and after 2 additional trips to Home Depot to make substitutions) I then went back, disassembled the whole sha-bang and finally reassembled the new piping making sure to use pipe dope on every joint. And because this is a closed system, we had to ensure that every segment increased in elevation to pooling of condensate which causes the banging sounds often heard in steam heat systems. Ahh.. At last. We had her all hooked up!